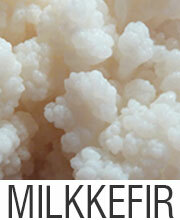 Water kefir (generally pronounced as keh-FEER) isn’t as popular as is milk kefir. But it’s basically the same concept. Moreover, it’s easy and also relatively quicker to make, additionally providing an abundance of probiotic for improving digestive health. Water kefir is basically a fermented beverage that is teeming with probiotic bacteria which is highly beneficial to us. It is simple and at the same time quick to prepare. Once brewed, it tastes absolutely delicious. Small children enjoy it too. It possesses a slight sweetness to crisp, yeasty, earthy flavor, depending on how it has been prepared. Sometimes if the yeasts are more in the brew then it contains a small amount of alcohol. It is a bit fizzy when bottled. Water kefir is not only a wonderful source of the beneficial bacteria; but also consists of a variety of organic acids, enzymes and a wide range of vitamins like vitamin K, B vitamins as well as folic acid (2). It is something your family and you can use for your skin daily or drink daily. Dissolve one third cup of sugar in a cup of water in a pot on the stove. Allow it to cool slightly, then add three cups of water to it. Pour over this mixture in a half gallon jar (mason) and add one and half cups of water again (so that this jar is filled up to the 6 cup mark). 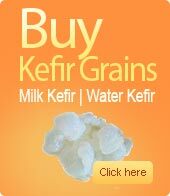 If the water is at room temperature, pour one third cup of kefir grains (water). Add about some drops of lemon juice. Cover using a coffee filter or a tea towel and secure using any rubber band. Leave this in a warm place for about 24 up to about 48 hours. The longer it is left, the less sweet it is going to be. 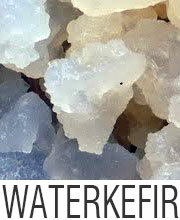 Taste your water kefir daily to check if it has reached the desired sweetness. If it does, strain the grains on placing the plastic strainer on some other mason jar and pour this kefir through it. 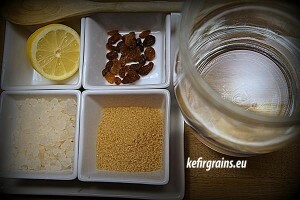 Use plastic strainers as some metals can be reactive, thus not recommended for using with the kefir grains. Store grains in sugar water blend in the fridge or use to begin another batch of homemade water kefir. As the kefirgrains are removed, a second fermentation would make it perfect. During the second fermentation add fruit (dried or fresh) or you can also add fruit juice for that making it flavorsome. Rather than using a coffee filter or towel to cover its top, place a plastic wrap on the mouth and on the lid. It will keep the air out and permit to form bubbles. Leave this water kefir totally covered for 24 to about 48 hours. Strain out fruit pieces. Then pour into a clean bottle or container.